To spread awareness about frogs, Australian Arts organization have joined with the 'Save the frogs' team which was founded by Ecologist Dr. Kerry Kriger in May 2008. Did you know that the international frog's day falls on April 30th? Save the frogs was started as a measure to avert the extinction of our beloved frogs and to spread awareness. People of all ages, nationalities, and skill levels are encouraged to enter the contest. According to savethefrogs.com/,"The SAVE THE FROGS! 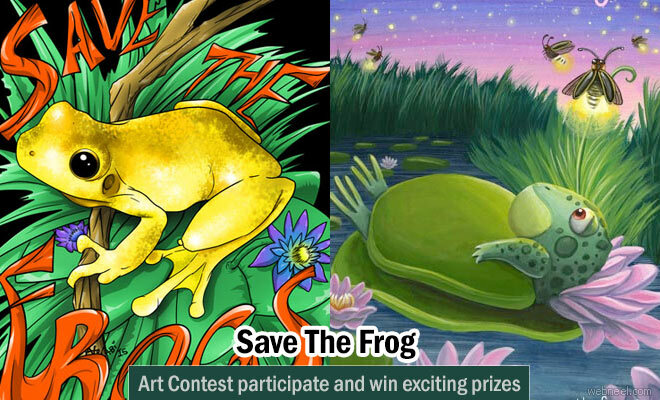 Art Contest invites you to create your coolest frog artwork. The contest will raise awareness of the amphibian extinction problem by getting people involved and interested, and the artwork will be used on t-shirts, stickers, posters, coffee mugs, hats, and in greeting cards and books, to both publicize our cause and raise money for SAVE THE FROGS! amphibian conservation efforts". (3) Become an official judge of next year's SAVE THE FROGS! Art Contest. (1) Every year the contest is held from April 1st till October 15th. (2) Submitted artwork must be your original creation! (3) No tracing of others' artwork. (4) Your art should not be larger than 8.5" x 11" (22cm x 28cm) in size (A4 is acceptable). Please do not send larger art, which (a) uses more raw materials; (b) costs you more to ship; and (c) is more difficult for SAVE THE FROGS! to store and distribute. c) both SAVE THE FROGS! and savethefrogs.com/ (as in the logo below). Artwork may be hand-drawn or digitally produced. It can feature frogs, toads, salamander, newts or caecilians. It can be full-color or black & white (e.g. one-color frog outlines of the type used for a coloring book. You can even draw a logo if you like. It's up to you! (5) Submission of artwork constitutes your agreement to the Art Contest Terms & Conditions. Please read these over, as they describe your rights to the submitted artwork as well as ours. -- No glitter please -- it's messy! -- No tracing of other people's content. -- Package your art well so that it does not get bent up. Definitely write DO NOT BEND! on both sides of the package. -- Whitespace does not look very appealing. We suggest putting color on the entire piece. -- Do not put your frogs at the extreme edge of your art, as that would result in them getting chopped off if they went to print. Try to leave at least 0.25in (6.5mm) of "other art" such as leaves, grass, river etc...we would rather chop the river edge than the frog's leg! The same goes for any writing on your art: don't put it too near the edge. -- Your writing is just as important as your drawing. Whatever text you put on your art, whether it be SAVE THE FROGS!,savethefrogs.com/ or a line of poetry, make it look nice, not like a last minute, hurried addition. Here are the winners from 2015 and most of them are school students.